The first portion of my Wildlife Ecology and Management course covers the tricky parts of wildlife management in the United States. Some of the problems come because we are, literally, united states. States are given the responsibility to manage wildlife for the good of the people, except in cases where the federal government needs to step in. And, the question--through the years--has been, when does the federal government NEED to step in? Migratory birds are one example, where federal laws trump state laws. These days, the states and the federal government set regulations through collaborations on Flyway Councils (Pacific, Central, Mississippi, and Atlantic flyways meet separately). But, it wasn't always that way. "The seasons opens one half hour prior to daylight on October 20, and closes at sunset on November 19. The state law, which becomes ineffective, has fixed the season for the month of October." The article goes on to explain that bag limits will be 15 ducks per day (30 in possession) and 4 geese per day (5 in possession). I'm sure my colleagues at state agencies and federal agencies would say this is just run of the mill stuff. Yet, I enjoyed finding an article from the exact time that the state and feds started clashing over the management of waterfowl. 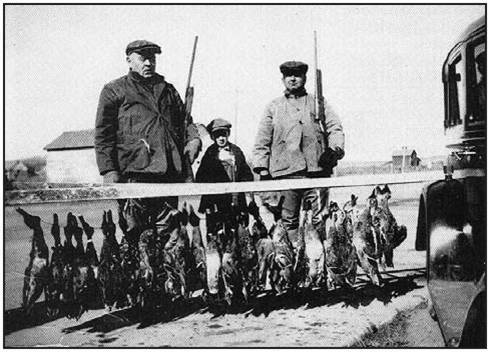 Photo of waterfowl hunters in 1930 from Nebraska’s Niobrara River Valley. Photo provided by Larry Schaffer, published in July 2003 NEBRASKAland magazine. Used with permission of the owner, Lois (Cole) Schaffer. Lois is the sister of Zane Cole, the young man in the center of the photo. Her father, Guy Cole, is at the right; Guy’s brother-in-law, Pat McGinnis, is at left. I obtained permission to use this photo for a teaching exercise, which I wrote about here.